The writers of the comic book hero and lawman Judge Dredd have caused a stir among fans by suggesting he might be gay. The latest edition of the comic 2000 AD, set in 2135, is titled Closet and deals with the issue of a teenager coming out. 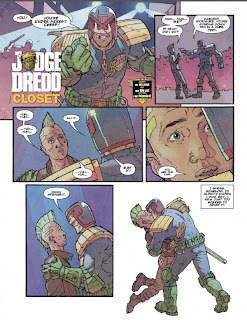 When the first page was released online, it showed Dredd kissing a youth in a gay club. The closing caption reads: "I guess, somehow, I'd always known I was gay. I was just too scared to admit it." Some fans have become so hostile to the idea they have threatened to burn the comic if the masculine hero is revealed to be gay. 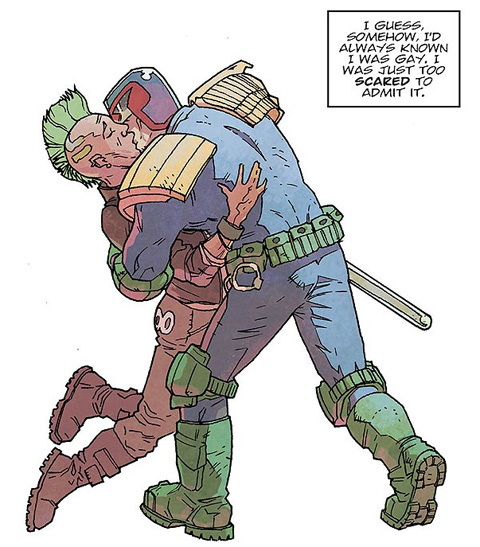 Writer Rob Williams has continued to tease the idea of Dredd being gay. ‘Sure, Dredd could be gay,’ he said. ‘You can’t look at the original costume design of leather and chains and not see a fetishistic edge there. He added: ‘As long as you stay true to the character throughout – which I think Closet does - you can deal with all sorts of issues in a story. ‘And if they push people's buttons, fine. I'd rather a story be provocative than just, “and they have a fight”.